Photo of Ch Toveri Arvokas owned by Mrs. Joan Bateman. Photo by sannse at the City of Birmingham Championship Dog Show, 29th August 2003. This file is licensed under the Creative Commons Attribution-Share Alike 3.0 Unported license. 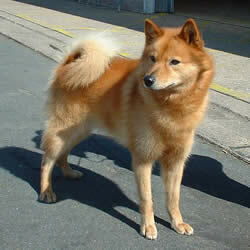 The Finnish Spitz is a medium-sized dog with a distinct fox-like appearance. The dog’s build is sturdy and its expressions sweet and alert. The Spitz has a short coat that is longer on the body than the head. The Finnish Spitz comes from Finland and is the national dog of that country. It is believed that these dogs originated from the camp followers and guard dogs of the early Finno-Ugrian tribes who eventually evolved into hunting dogs. Known by multiple names, including Finnish Hunting Dogs and Barking Bird Dogs, the breed was nicknamed Finkie in the 1920s when it was imported by British breeders, who bred the dogs to hunt grouse and other game birds. The AKC registered this dog breed in 1991. The Finnish Spitz is extremely independent and often aloof. Extremely faithful and dependable, these dogs will often form close bonds with particular individuals. However, in general they enjoy human companionship and taking part in family activities, though they may be reserved around strangers. This dog breed has a temperament that is easily upset, so care should be taken not to expose it to tension-filled environments. These dogs are by nature highly independent. It is therefore very important that they are allowed to get to know others as a puppy. While they can co-exist with most other household animals, there can be a tendency to chase small animals and even birds since these were originally hunting dogs. Living Environment – This medium dog breed is comfortable in an apartment provided it gets enough exercise. It is relatively inactive indoors and prefers cool climates. Grooming – This breed requires relatively little grooming, though it can shed heavily at certain times. The Finkie’s coat needs only a weekly brushing though it needs more frequent brushing when it is shedding heavily. Diet & Exercise – It is very important that these dogs get adequate physical and mental stimulation as boredom can drive them to destructive behaviour. These active and lively dogs love to play and need plenty of daily exercise. However, they must always be kept on a leash unless in a safe, enclosed area, since these dogs have a tendency to wander off on their own hunts. Health – Generally, this is a healthy breed and not prone to genetic ailments. Common health concerns include luxating patella, cataracts and HD. Make sure that your puppy’s parents have OFA (Orthopedic Foundation for Animals) and CERF (Canine Eye Registration Foundation) certification before taking home your pet. This dog is well suited to both experienced and inexperienced dog owners. Strong minded and lively, the Finkie is an intelligent dog who learns quickly, which make the job of dog training much easier. However, the breed can be independent and wilful, which can counter efforts to train. A Finkie trainer needs to be assertive and confident.